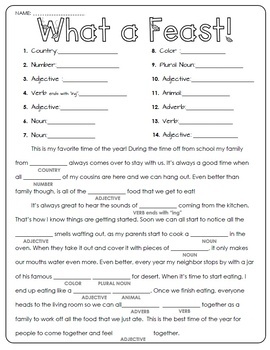 Share some gobbles and (plural nouns) while having fun practicing grammar! 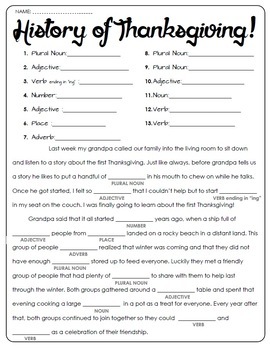 Here is a fun way to compliment all your festive activities, as well as sneaking in some practice with recognizing and using the parts of speech. This pack includes the following. ✔ "What A Feast!" including 14 opportunities for student ideas. 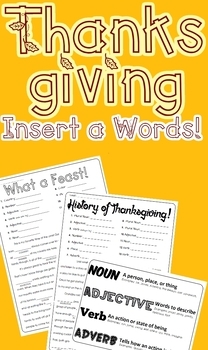 ✔ "History of Thanksgiving!" including 13 opportunities for student ideas. ✔ Parts of Speech Cheat Sheet to help guide students. Also included is a handy dandy parts of speech cheat sheet. 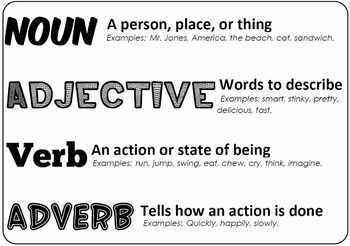 This handy guide will help remind students just what a noun, verb, adjective, or adverb is. Great for displaying on a projector or for handing out individually. Each sheet has been designed to work when used as partner practice or as individual practice.